The concept was born as a solution to the basic hurdles in the process of opening a point of sale store: finding a property, building issues, permits and the risk that comes along opening a new business. With La Tazza you now have the opportunity, if you wish, to change or move to a new location. Consumption in a high rotation bar whenever there is a wish of fast product consumption. Consumption sitting in tables (wherever there is space): For those consumers that want to take it easy. Take away: for those that consumers that want to take it with them. Situated in areas of high demand. Fresh and revolutionary concept image. Portable and mobile point of sale. La Tazza Meeting Point is a NEW AND UNIQUE CONCEPT. You do not need, search nor have a property; La Tazza is the property. Not only it is portable and mobile, it is equipped with independent power and water generators for operations in interior and exterior venues. La Tazza, can operate as a business within a business, it can be situated within another business with high traffic of consumers, thus enabling to capture the consumer for a longer time period and provide additional revenue opportunities. 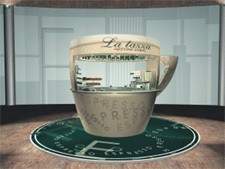 La Tazza has been designed to attract, satisfy and fidelize consumers. Lastly, if there is very little consumer traffic or if there is no cafeteria as a meeting point, La Tazza brings the opportunity to be used as a resting area, Our experience indicates that if we situate La Tazza as a complement to an existing Entertainment Venue such a Kiddy Parks, then you will experience better results. To learn more about the La Tazza Meeting Point franchise opportunity, simply complete the form below.